Cracker Barrel Double Fudge Coca Cola Cake is a tasty cake. We tried several versions of the Cracker Barrel Coca Cola cake to get this one just right. 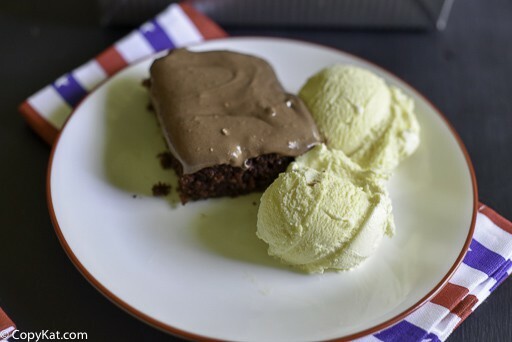 You can make a delicious copycat version of the Cracker Barrel Double Fudge Coca Cola Cake. 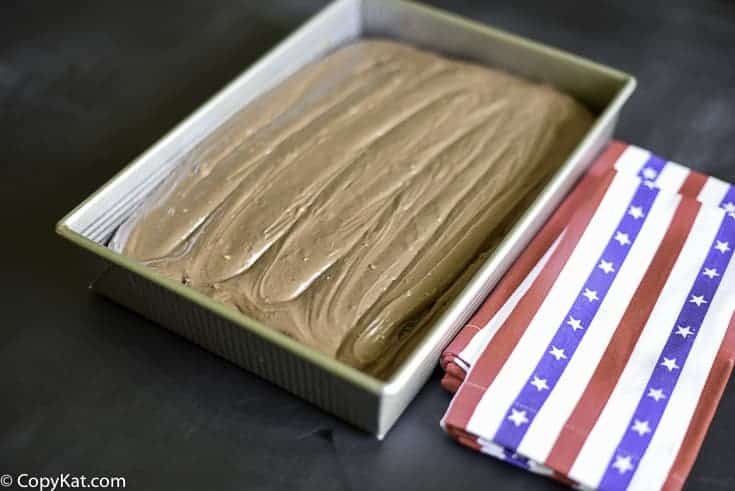 You can recreate the Cracker Barrel Double Fudge Coca Cola Cake at home with this easy copycat recipe. This recipe is made from scratch. You will be amazed at just how moist this recipe is. It is an incredibly moist chocolate cake. This recipe has coca cola in the cake batter. This cake also contains buttermilk, baking soda, and lots of dark cocoa. You can use regular cocoa, but you may want to try a dark cocoa like this King Author Double Dark Cocoa. You may want to use this frosting for this cake, or for other chocolate cakes. This frosting is super easy to make, and if you like you could add about 1 1/2 cups of pecans to this recipe. I know you are bound to fall in love with this just as much as my family has. 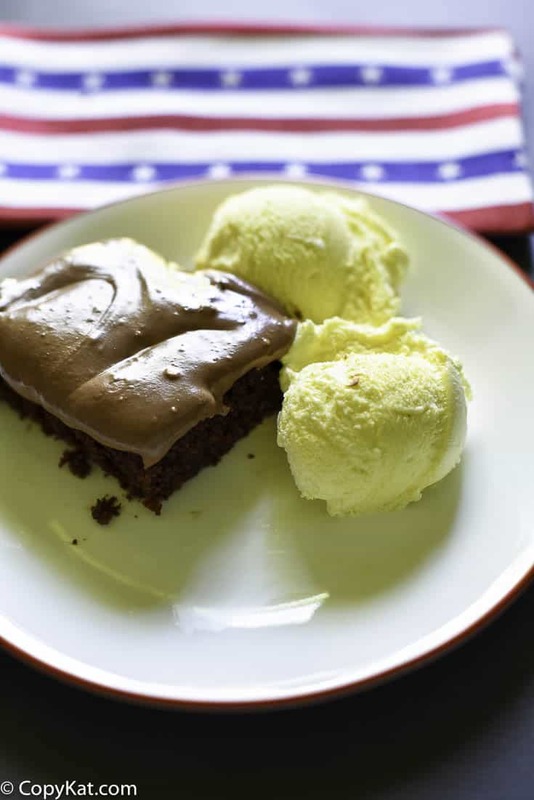 You can make the Cracker Barrel Double Fudge Coca Cola Cake at home with this copycat recipe. Preheat the oven to 350 degrees. Place in a saucepan butter, coke, semi-sweet baking square and bring to a boil remove from heat and add marshmallows and stir until all is blended and the marshmallows are disappear. Set aside to cool enough to tepid or room temperature. In mixing bowl blend the shortening, oil, vanilla, and sugar until fluffy. Add eggs and buttermilk and beat until smooth. In another bowl mix flour with baking soda, cocoa, baking powder and salt, add half of the flour mixture to shortening, egg mixture, and beat. Scrape bowl time to time to clean the sides off so ingredients are blended in the batter. Add cooled coca-cola mixture and beat. Add remainder of flour and beat until completely smooth about 3 - 4 minutes. The batter will be thick. Place batter into a 13" x 9" x " 2 greased and floured baking pan. Set pan on top shelf in a preheated 350 degrees oven for 35 - 40 minutes. Check for completed baking time with a toothpick. If the toothpick comes out clean by sticking in the middle of the cake its time to come out of the oven and cool. Frosting In a bowl cream together margarine, cocoa, confectioners' sugar. Slowly add the 6 tablespoons of cream or milk. Add in vanilla. Frost warm cake. Serve with natural vanilla bean ice cream and enjoy. I just made these as cupcakes, 3T batter per, for 16 minutes. It made 42 cupcakes. I really creamed the frosting and it turned out fluffy and stupendous! Thank you for those details! Very helpful. What is the purpose of the marshmallows? I’m making this cake tomorrow for my son’s birthday, but just can’t decide which recipe. Ack! Some include marshmallows, some don’t. I’m wondering why? The marshmallows add a lot to the cake. They make the cake more creamy and rich. Yeilds approximately 40 cupcakes (fill 3/4 full, cook for 19 minutes). This recipe is clearly the best one of the two I just compared. This is much richer in flavor, more chocolate (as you read the recipe) and I won’t make the other one again. I don’t bake at all, but decided to make it after seeing at the restuarant. I am shocked at the flavor this recipe offers. All others cannot compare to this one. Don’t waste your time; follow this above recipe. I strongly object to Mrs. B comments below. Yes, the Coca-cola and marshmallows are the vital part. Leave nothing out; cook exactly as told. YUM!!!! If you really want the recipe, go to the Coca Cola Company Web site, they have it listed. I worked at Cracker Barrel and the secret is the coca cola and marshmallows. It is a very simple cake. As a professional in the restaurant business, this cake tastes nor looks anything like Cracker Barrel’s Coca-Cola Cake. I had my doubts from looking the recipe over…and sure enough, after following the recipe exactly, the product was simply a chocolate cake. It took nearly an hour to bake and was time consuming too! Baking is my livelyhood, so it isn’t a question of whether I made it wrong…it just isn’t correct & true recipe! Thank you for your critical comment. I am sorry you disliked the recipe. I haven’t made this yet, but I have to mention that I love the Fiestaware in the picture of the cake! I collect it, and live really near the pottery. Made recipe just like it was printed and it was very dry and crumbled when cut. The taste was ok, bur not comparable to the real thing. I can tell you one thing about this cake. It has to sit for over an hour after it is frosted. Even though I work at Cracker Barrel, we don’t know how this is made. The cake mix comes in a bag ready to pour and bake. I made this to a T tonight and it tastes NOTHING like Cracker Barrels version. It was not the baking that did it in, the ingredients just are not right. The cake was bland and the icing was ridiculously sweet and laced with too much powdered sugar. Sorry but not a true copy cat.